1. Our post-retirement income will be less than our pre-retirement income. 2. Our taxable income will be lower after age 65. 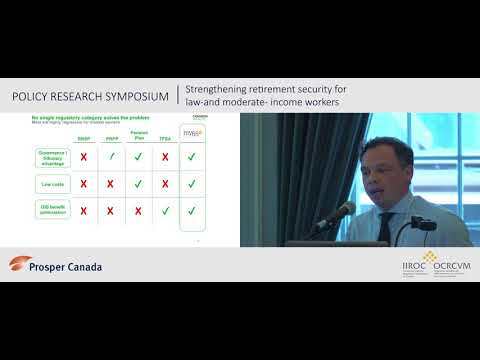 The reality is that many low-income seniors’ incomes increase when they turn 65, as they become eligible for Old Age Security (OAS), the Guaranteed Income Supplement (GIS) and/or Canadian Pension Plan (CPP) benefits. Depending on the individual’s mix of income sources, this increase can result in them facing higher taxes once they reach 65. Because many low-income seniors and financial advisors aren’t aware of this fact, seniors risk making choices that will leave them with less – not more – money in their retirement. On October 25th, the Centre for Addiction and Mental Health (CAMH) hosted a community forum in Toronto organized by Open Policy Ontario, St. Christopher House, Woodgreen Community Services, and SEDI to launch a new information kit called Planning for Retirement on a Low-Income. This was developed by Open Policy to provide clear, relevant and accessible financial planning information to low-income, older Ontarians. At the launch, Michael Creek of Working for Change reflected on his own experience living in poverty and how these tools can, as he said, “make a real difference in people’s lives.” Miryam Zeballos from St. Christopher House also outlined the usefulness of this resource in helping to establish GIS and CPP eligibility for older newcomers. The booklets and additional resources, including the presentations made on October 25th, are available online. They are valuable resources for low-income people and organizations seeking reliable financial information and advice to offer their low-income clients. Natasha McKenna is a Financial Literacy Trainer and Coordinator with the CCFL. She was a member of the agency reference group for the Low Income Retirement Planning tools.